If your accounting system requires a purchase order number feel free to enter it here so that we can help you keep track of all such orders. Our clients typically ask us to prepare drawings based on certain inputs. Those inputs can range from sketches, to scanned images of old blueprints, to 2D AutoCAD files which we use to create 3D models. This information goes directly into our workflow system which our large pool of in-house draftsmen, engineers and architects can view. In order to comply with ISO 27000 procedures requiring information security we must avoid all client details in this data field. If you enter any personal or company details, they will be deleted to protect your privacy. Please use this field only if you do not want the output file to go to your email address. 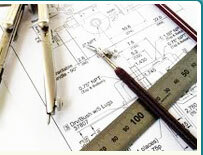 Our regular customers can also log in to their accounts to view their project online. Contact us to find out how to set up your own account. We'll let you know immediately if we cannot meet your deadline. 99% of the time, we can. Pick the file (from your hard disk or any other data location) that you would like us to use as our input for this project. This is to avoid automated submissions by spammers. We appreciate your feedback on this as it helps us improve our marketing, and also makes it easier for us to identify which of our promotional activities work best. If you have a promotion code, enter it here to take advantage of our special offers.